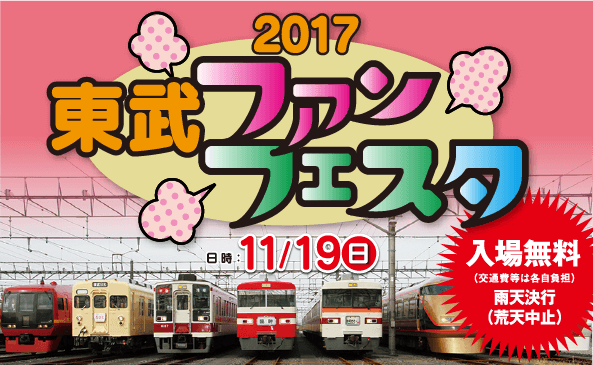 "2017 TOBU FAN FESTA" will be held as below and you can see real major TOBU cars here. *Free shuttle bus is available from Minami-Kurihashi station. We will sell the following Rokuhan products at sales booth. You can make full line up "TAIJU" formation by above cars. Now TOBU C11- No.207 "TAIJU" and "YO 8000 Type Guard's van" model trains are available only from Rokuhan. Please enjoy TOBU station locomotive models at your home. Let's join TOBU FAN FESTA!! 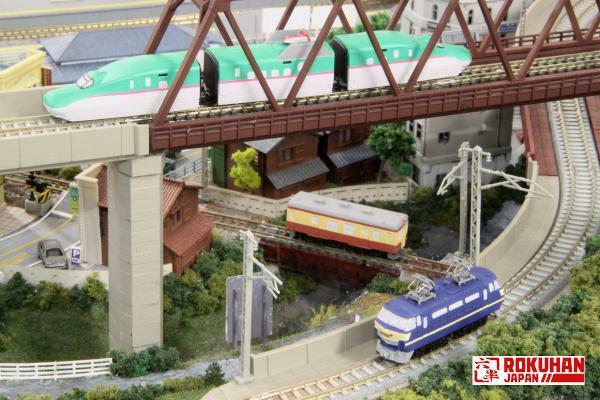 41st Japan Railroad Model Show! We Rokuhan will exhibit our products at the 41st Japan Railroad Model Show held in Ota City Industrial Plaza (PiO) which is held by Japan Model Railroad Association (JMRA). We look forward to your visit and see you at our booth! 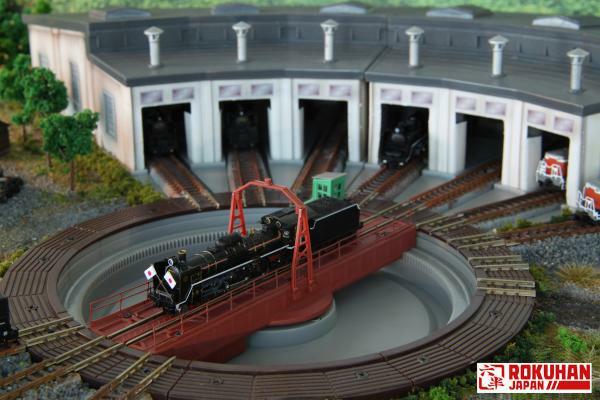 Please follow on Facebook: 41st Japan Railroad Model Show! Introduction of Z Shorty from Rokuhan! *Z Shorty length is almost half-size of original Z scale railroad cars. *Display model with high details appearance. *Use some etched metal parts as well as original Z scale railroad cars. *Z Shorty can be make run on original Rokuhan tracks with motor unite chassis and trailer chassis ( sold separately). Line up planning to be released at present is as follows. *High speed Shinkansen " HAYABUSA"
*Trailer car chassis for Shinkansen body. We will start deliver January next year 2018. Please make reservation for our products of your Rokuhan hobby retailer. *"Power Chassis" and "Trailer Chassis" of Z Shorty series are dedicated to Z shorty. Please follow on Facebook: Introduction of Z Shorty from Rokuhan! Delivery of YO 8000 start on 6/October! on 6/October in Japan, also start delivery for overseas soon after. *YO 8000 Type Guard's van were produced from 1974 to 1979 for the replacement of existing car. *At this stage, it is to be retired gradually. *Some YO 8000 are still kept at JFR Co. for the limited use. *Completely rendered based on JFR Co. owned YO 8000. *Handrails are made by sophisticated precisive etched metal. *Assembled weight plate inside body provides stable running performance. Please follow on Facebook: Delivery of YO 8000 start on 6/October! Delivery of JNR C11 Steam Locomotive No. 254 Type (Montetsu Smoke Deflectors) and C11 No. 325 Moka Railway Type start on 6/October! It was manufacture in 1944 which had been in operation in Kyushu（九州） area. It is currently in stored in Aizu-Tajima（会津田島） Station, Fukushima. *Characteristic smoke deflector is made of etched metal. *Engine can be run in reverse and be double headed when dummy front coupler is replaced with included optional coupler. Rokuhan start resale C11 Steam locomotive No.325 Moka railway type. It was manufactured in 1946 and currently stored in Moka Station, in Tochigi. Rokuhan C11 No.325 is designated by year 2005 type due to miner modification from the original type. *Characteristic smoke deflector is made of etched metal. It represents spec as modified in 2005. Please follow on Facebook:Delivery of JNR C11 Steam Locomotive No. 254 Type (Montetsu Smoke Deflectors) and C11 No. 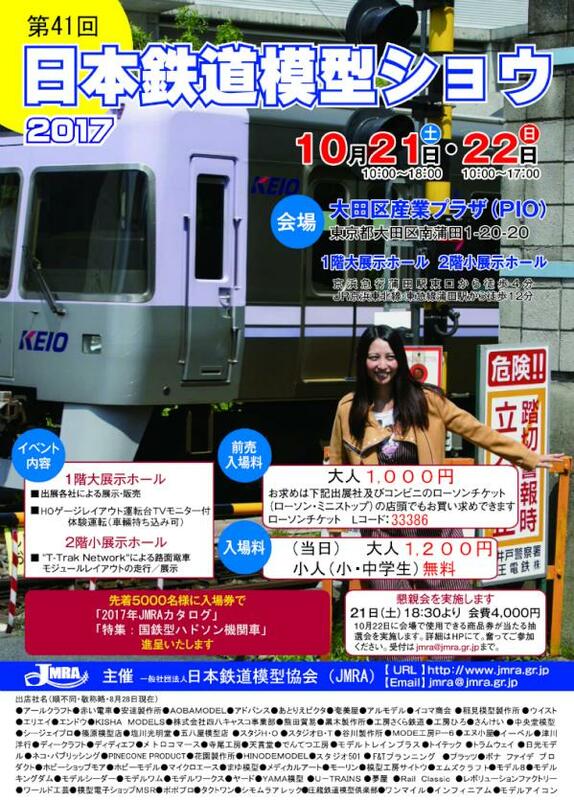 325 Moka Railway Type start on 6/October! We decided to reproduce S037, "Digital Turntable"! *It is used digitally controlled stepper motor, so it can set turntable position accurately. *The turntable control cabin is removable. *S038, Round House (one or more), will fit with S037, Digital Turntable. *Required A028, Rokuhan AC adapter, when connected with S037, Digital Turntable only. *Not required A028 Rokuhan AC adapter, when connected with S037, Digital Turntable, with RC-03, controller, or C005, e-Train controller. *The A036 extension cable, may be required depending on your layout size. Note: A028, A036, RC-03, and S038 are sold separately. Please follow on Facebook: Digital turntable reproduction! We Rokuhan will exhibit our booth in the "57th ALL JAPAN MODEL & HOBBY SHOW 2017" at Tokyo Big Sight. Also, in our product sales corner, we will sell limited Rokuhan products for purchase, including "E6 Type Shinkansen Komachi" at out booth, so please do not miss out on this opportunity! In addition in our booth, you will see various exhibitions of projects under development. Introduction of Decoders from Rokuhan! Thank you for your continued interest at Rokuhan products! We would like to introduce you to our mobile and stationary DECODERs for DCC use. These decoders are currently under development currently for control of car interior lighting and mounted on the room light PCB such as A009, A015, A030, etc., and in addition for use with two wire controlled turnouts. The following five items, are the first decoders in our product line. This small sized decoder is small enough to fit in most Z, N, and HO engines. It is the same basic size as A009, Room Light type A and includes room light Function (F1), to control car interior lighting on/off function. It is the same basic size as A015, Room Light type B, and includes room light function (F1), to control car interior lighting on/off function. It is the same basic size as A030, Room Light for Shinkansen Front car, and light function (F1), to control car interior lighting on/off function. It is the same base size of A031, Room Light for Shinkansen Middle car, and light function (F1), to control car interior lighting on/off function. Also, it is necessary to connect decoder called "stationary Decoder" for operating turnout by DCC. This decoder is under development by Rokuhan. This stationary decoder is for use with any two-wire controlled turnout, Z, N, or HO gauge. We will update functions or specification of our Rokuhan decoders, on our Facebook and Home pages. We will start deliver this fall 2017. Please watch for our announcements. *Some soldering and car will be required on light boards for installation of decoders. Please installation is the responsibility of the purchaser, please work safely. Please follow on Facebook: Introduction of Decoders from Rokuhan!